In its proper form, it is not hard to see why Gojira is one of the greatest Japanese films of all time and, arguably, anywhere else in the world. Director Ishiro Honda had one goal with the film, and he succeeded unquestionably. Shaken by what he witnessed after the Hiroshima bomb devastated his country, film became his outlet. Avoiding the topic directly, as not to terrify or scar an audience so recently afflicted, he chose to carry over the concept from an American film, The Beast from 20,000 Fathoms. However, Honda’s film was far more than a simple monster-on-the-loose exploitation piece. It had a message. In what would be a rare decision for the genre, it would show the human element, death and suffering. The bomb that changed Japan took the shape of a 200-foot tall creature rampaging through Japan’s streets. Born from the blast and unstoppable, this black giant tramples Honda’s own country. Flames fire from its mouth, incinerating anything even remotely close. This includes a mother holding her children as she explains they’ll soon join daddy in heaven. Seconds later Godzilla douses the area with fire. The military loses their struggle, wiped out in a matter of seconds whenever they meet the mutated beast. It’s a hard film to watch in its proper form – bleak and hopeless. As the monster walks on shore though, there’s a compelling, deep, human drama at work as well. Not only are the characters of Emiko (Momoko Kochi), Ogata (Akira Takarada), and Dr. Serizawa (Akihiko Hirata) finely acted by some of Toho’s soon-to-be stars, their love triangle adds an extra layer of drama. A defiant yet torn Emiko pushes aside her arranged marriage with Serizawa to be with Ogata. At the film’s climax, a broken Serizawa unleashes his own monstrosity of a weapon to defeat the beast. Sacrificing his life for the world so his Oxygen Destroyer plans will die with him, he lets Emiko go with the man she loves. While the idea of a small family in turmoil seems minute in the face of assured destruction at the hands of something completely unstoppable, the extra emotional pull is enough to send any film viewer into tears. Godzilla’s death at the hands of man is violent and, of course, tragic. It has meaning on both a surface level and buried inside the dialogue. Metaphors are powerful and unforgettable. The special effects, depressingly tossed aside as a man-in-a-suit stomping cardboard buildings to those who have never even viewed the first film, sell the destruction on an even higher level. Nothing is left standing in Godzilla’s ferocious and uncaring wake. Tokyo is leveled, and that’s not an exaggeration. It’s the only appropriate end for the city given the film’s purpose. Scenes of smoldering streets the next morning, children setting off Geiger counters as they enter a hospital, and the entire city in flames are the after-effects barely seen in films of this nature. Godzilla’s lack of movement comes off as unflinching, willing to stand up against anything humankind has to try to stop him. Its lumbering pace only serves to create a believable size and mass, creating a creature that is defiant. It is not here to simply wipe out humanity, but slowly dismantle it one city at a time. With a meager budget compared to those of Hollywood efforts, the few effects shots which go astray have to be acknowledged. The heart of the film is still there, even when a wire coming from a miniature plane makes it on film, or missiles magically bounce off the sky after missing their target. The purpose simply overpowers the flaws. Akira Ifukube’s downbeat and heavy soundtrack creates a true sense of dread. The theme played along with Godzilla’s final rampage is a flawless accompaniment to the on-screen mayhem. 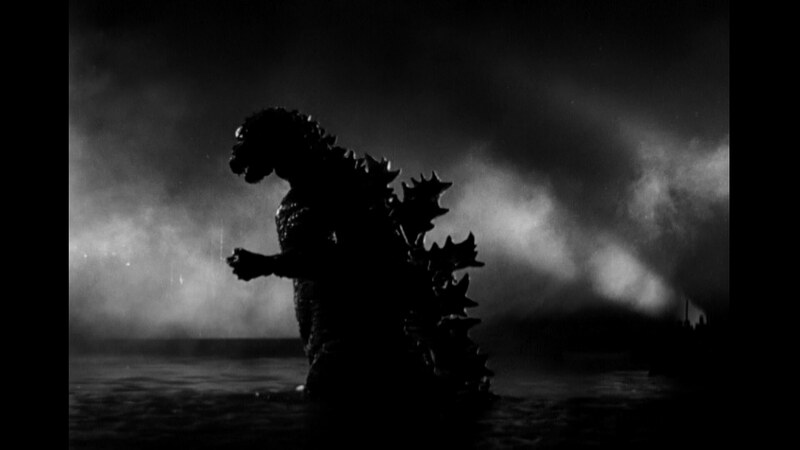 The filmmakers wisely avoid using music to carry certain scenes as well, instead using sound effects or eerie silence as Godzilla looks to his next victim. The use of silence is at times more horrific, a quiet city waiting to be demolished underfoot. Godzilla’s final moments are oddly emotional. The beast rises from the sea, screaming in pain as the Oxygen Destroyer melts his body. Despite his wrath, Honda creates a creature that is faultless for its actions. Man is the enemy and the reason the film exists. It took over 50 years for the Japanese version of Godzilla to arrive in the US, and only two years to make it to Blu-ray. Sadly, the short wait has not been beneficial. This is a 1080i AVC encode, the problems as sizeable as the title creature. The print used is the same as the previous DVD release meaning source damage is terrible. Scratches, specks, lines, dirt, and more are prevalent. Those who grew up with the film are likely used to this, but it is no excuse as Toho’s DVD release was near perfection, not to mention this is the least of the issues. The encode causes some odd artifacting issues. Horizontal lines run across the screen, and look like clumps of noisy grain. They are most noticeable on bright backgrounds (the sky during the first voyage to the island), or when the camera moves vertically. Interlacing is severe at times, although not always present. The faster the motion, the worse it is. Despite all of that, the biggest issue is a jumpy, flickering source. Part of the video seems to sit still while other sections move around. Watch the curtains during the hearing before the crew travels to Odo Island to see one of countless shots where an object suddenly appears to float (the curtains in this case) around the screen while the rest of the image stays put. It is incredibly distracting. Are there any positives? Yes. Blacks are richer and deeper than previously seen. Minimal crush is evident. The contrast is bright, and image depth is improved overall. Some noticeable facial detail is cleaner, including Serizawa’s injured eye make-up. Disappointing. A 2.0 PCM mix makes some notable improvements to the audio track. Ifukube’s score is fuller, if still muffled. It tends to blend with the action better, although the jet attack seems notably quieter as the score dominates the scene. Popping is evident, as are dropouts during transitions. Godzilla’s roar is somewhat cleaner, louder, and crisper. Footsteps contain some added power, hardly sounding as flat as they used to. Dialogue has a regular undercurrent of static and popping, but is always audible. Extras carry over from the DVD, with the exception of those exclusive to the US version, which for some odd reason, is not included on this disc. Only the Japanese version exists here, meaning the commentary for that version is gone which included archival interviews and comparisons. The first featurette discusses the Godzilla suit itself. This includes rare photographs, some of which even die-hard fans have never seen. Concept drawings, including some that attempt to make his head resemble a mushroom cloud were tossed for the right reasons. Others show the first suit build in which Nakajima was unable to move inside and various storyboards. Ed Godziszewski narrates this slide show effectively. The second concerns story development. Here, the first draft of the script is discussed at length; including wildly varying characters, dropped subplots, and a slightly more generic tone overall. Again, Godziszewski narrates a slide show of various photos, including one that shows the actual shooting script. The commentary that is included is fine. Ryfle is the dominant one here, while his partner Ed Godziszewski (writer of the extremely hard to find “Illustrated Encyclopedia of Godzilla”) spouts off a few comments. He was slightly more active on the better U.S. commentary. The Japanese version’s commentary is hardly a disappointment; it’s simply dry and monotone in comparison. Ryfle reads off various facts while only pointing out a few things about the film you’re watching. Some of these comments overlap the featurettes (and booklet inside the DVD but not the Blu-ray). Full disclosure: This Blu-ray was provided to us by The Morris & King Company. This has not affected the editorial process. For more information on how we handle review material, please visit our about us page to learn more.